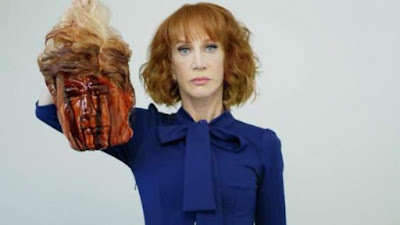 Kathy Griffin recently participated in a photo shoot that beheaded the President of the United States. She has since faced a fierce political backlash from people of all sectors. It was even said that Baron Trump who’s the president’s son thought the photo was real and started to panic. Kathy Griffin then lost her job at CNN and even had advertisers pull their ads from her many shows. Today Kathy Griffin held a press conference to address her infamous photo. She said that the Trump family has tried o “ruin” her in the face of controversy. She also stated that she will continue to make fun of the president. Kathy Griffin was fired from CNN for the intense controversy and had at least five of her scheduled performances canceled because of the photo. She was standing next to her attorney. “I don’t think I will have a career after this. I’m going, to be honest, he broke me,” As Griffin began to tear up. “He picked me, I’m the easiest target,” she said. Griffin said that the very intense and debated photo is coming from a sexist campaign to destroy her career. During her press conference, she was, of course, asked about what she thought about Trump’s son (Baron Trump) being traumatized by the image and panicking and of course worrying about his father’s safety. It was mentioned that Baron Trump did no know who Griffin was or the context of the image. The photo was taken by a photographer based in LA who is known as Tyler Shields. Griffin is also being investigated by the secret service at the moment. This was apparently confirmed by another one of her attorneys.